It's time for "Black Friday in July" with Amazon's third-annual Prime Day sale. This year's Prime Day starts at 9PM ET on July 10 and runs through July 11. Amazon wants you to stay glued to the site, with new sales launching as quickly as every five minutes throughout the 30-hour sale period. 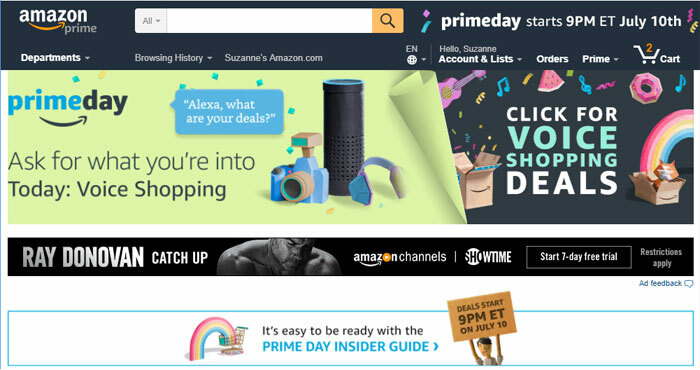 Prime Members should keep an eye on Amazon's Prime Day page to see early offers and stay on top of big sales when they start on the 10th. For instance, sales on Amazon services have already started, with 40% off Audible membership, 40% off Kindle Unlimited membership and four months of Music Unlimited for just $0.99. And starting today, Alexa will have more than 100 exclusive deals available on Amazon Echo, Echo Dot, Echo Show, Amazon Tap, Fire TV or compatible Fire tablets. Voice shoppers will also have early access to select Prime Day deals a full two hours before the general public beginning July 10th from 7 - 9 PM ET. There's no word on exactly what will be on sale for Prime Day, and historically the deals have featured a grab bag of products — not all of which are terribly exciting. However, Amazon promises big sales on televisions this year, so if you're in the market for a new TV, stay tuned. Prime Day is also usually the best time of the year to pick up Amazon products, like Kindle e-readers, Fire tablets and more. However, you should expect the better deals to sell out quickly, which can be a problem for anyone who can't sit in front of their computer all day. Fortunately, Amazon has some options for time-strapped shoppers. Using the Amazon app you can see current and upcoming deals from wherever you are. Once you download the app, just click on "Today's Deals" to see current bargains, then click "Upcoming" to see sales for the next 24 hours. Tap "Watch this deal" to get an alert when a deal is starting so you can snap it up before it's gone. Alexa-enabled devices, like the Echo, can help you track deals, too. If you aren't an Amazon fan, never fear because the competition will get in on the sales, too. We expect sales from Walmart, Target, Best Buy and other big retailers who had big sales in July prior years — with no membership fees required. But if you're trying to count your pennies this summer, be careful. Big sales like these can make it tempting to click the "buy" button without thinking a purchase through. If you're in the market for something specific, the budget friendly way to get it would be to make a shopping list to check against the day's sales — and try to avoid impulse buying anything else. While you need to be a member of Amazon's $99/year Prime program to take advantage of the deals, you can get access to all the deals through the Prime 30-day free trial. And Alexa device owners who are not yet Prime members can sign up for $79 for the first year.